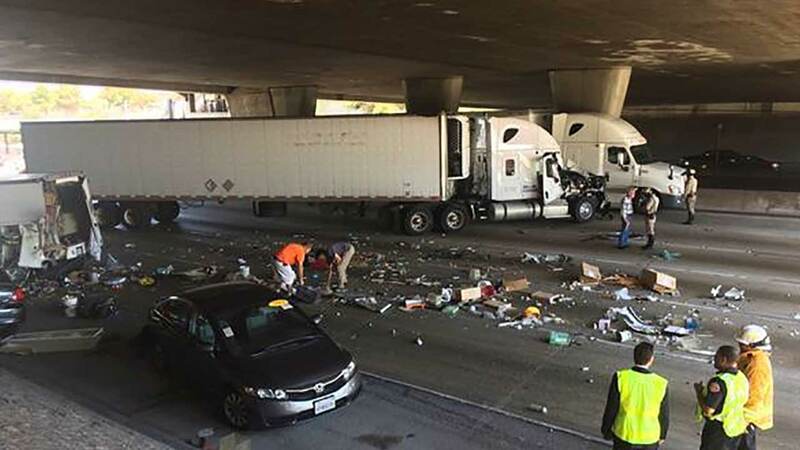 PASADENA, Calif. (KABC) -- All westbound lanes on the 210 Freeway were temporarily blocked near Lake Avenue in Pasadena Tuesday following a collision involving a big rig, a truck and a car that left four people injured. The crash was reported at about 2:30 p.m.
Pasadena Fire Department paramedics tended to four patients, all of whom were expected to be transported to hospitals, but none of the injuries were life-threatening, spokeswoman Lisa Derderian said. Drivers were advised to use Foothill and Orange Grove boulevards as alternate routes. The cause of the collision was under investigation by the California Highway Patrol. All westbound lanes reopened at about 4:45 p.m.